A phrenological mapping of the brain. 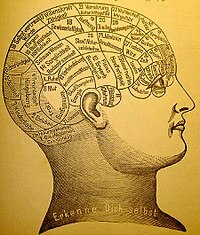 Phrenology was among the first attempts to correlate mental functions with specific parts of the brain. ↑ Dictionary.com, "mind": "1. (in a human or other conscious being) the element, part, substance, or process that reasons, thinks, feels, wills, perceives, judges, etc. : the processes of the human mind. 2. Psychology. the totality of conscious and unconscious mental processes and activities. 3. intellect or understanding, as distinguished from the faculties of feeling and willing; intelligence."